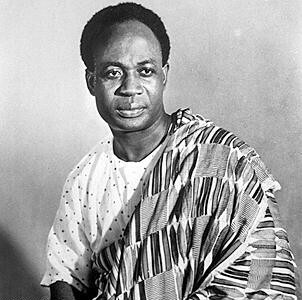 Kwame Nkrumah was born on Sept. 21, 1909, in Nkroful, Gold Coast (Ghana). He received his education from Catholic missionaries and later trained as a teacher. Later on, he taught elementary schools in town. Decades after his death in 1972, Nkrumah remained a symbol of the movement for African independence in the 1950s and 1960s. 1. In 1935, Nkrumah enrolled at Lincoln University in Pennsylvania. He earned a B.A. degree in 1939 and a Master of Science in education in 1942. 2. In the United States, Nkrumah became active in politics and race relations. He became exposed to the Pan-African ideas of political activist W.E.B. Du Bois and Jamaican Black Nationalist leader Marcus Garvey. 3. During the 1930s and ’40s, his leadership skills started to emerge when he joined a group of African students to create the National African Students Association, which he was elected president. He published his philosophical ideas in a pamphlet called Towards Colonial Freedom. 4. Nkrumah preached to Presbyterian Black churches in New York and Philadelphia during the 1940s. 5. His association with radical idealism attracted the attention of the FBI and was targeted by the FBI’s Counter Intelligence Program. 6. Nkrumah returned to Ghana in 1947 and became secretary general of the United Gold Coast Convention aimed at ending British rule. He founded the Convention People’s Party in 1949, the first Black political party in Africa. 7. The British jailed him in 1950 for political reasons. However, they allowed a new constitution to be drafted, with the first elections to be held in February 1951. Although he was under arrest, Nkrumah became the continent’s first African-born prime minister. After winning the 1951 election, Nkrumah went on to win elections in 1954 and 1956. 8. On March 6, 1957, the Gold Coast or Ghana became the first African colony to be independent of British rule. Ghana’s independence inspired the rest of the continent to follow suit. By the mid-1960s, over 30 African countries were independent. 9. He led a massive surge of socio-economic development in Ghana. Infrastructure improved across the country. Also, dams, hospitals, schools and universities were built. 10. In 2000, he was voted Africa’s Man of the Millennium by BBC World Service listeners. 11. Over his lifetime, Nkrumah was awarded honorary doctorates from Lincoln University, Moscow State University, Cairo University, Jagiellonian University in Poland, Humboldt University, and many others. Categories: Africa, Did you know?